It's happening. After years of talks and reports, it's actually, finally, in-paper, happening—Citi Bike is expanding. 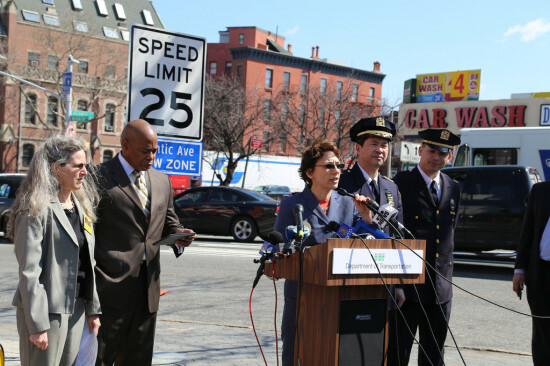 Tuesday, at the Queensbridge Houses in Queens, DOT Commissioner Polly Trottenberg announced that the system of 6,000 bikes will double by the end of 2017—putting 2,000 more bikes on the streets than initially envisioned when the program was launched. The news comes as Bikeshare Holdings, a private investment company headed by the CEOs of Equinox and Related Companies, acquires Alta Bicycle Share, which oversees Citi Bike, and other bikeshare programs around the world. As the Daily News first reported, former MTA Chairman Jay Walder will serve as Alta's new CEO. Starting next year, a new fleet of blue bikes will arrive in Williamsburg, Greenpoint, and Bedford-Stuyvesant in Brooklyn, and in Long Island City, Queens. 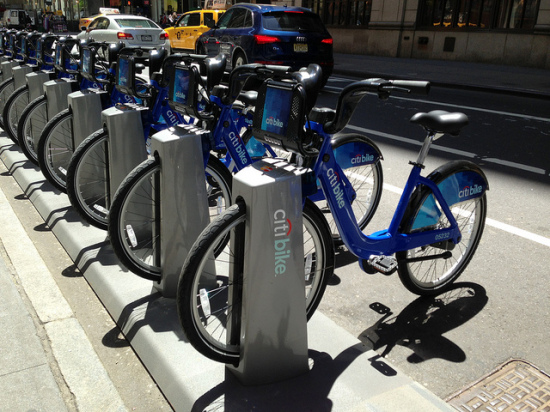 As Citi Bike noted on its blog, all of these stations were intended to be part of the program's "initial deployment." 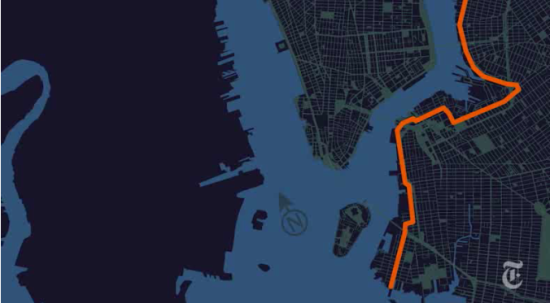 Based on a map provided by Citi Bike, the second phase of expansion will include Upper Manhattan, Astoria, Queens, and more Brooklyn neighborhoods. But the system won't just be expanded, it will be entirely overhauled. Anyone who has been on a Citi Bike recently knows why—seats are torn, bikes are broken, docks are out-of-service, and the credit card system is glitchy. To pay for all of this, and to keep the program solvent moving forward, Citi Bike will raise the annual membership fee from $95 a year to $149. 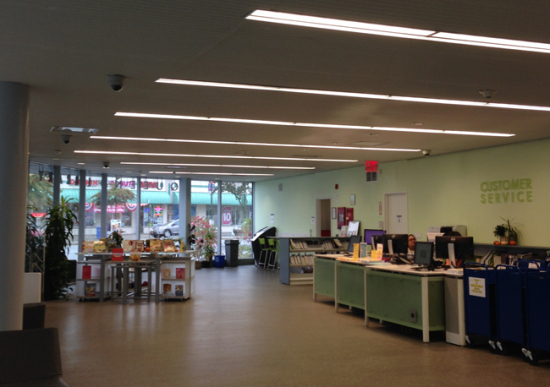 The $60 annual membership New York City Housing residents will not change. According to the NYC DOT, Bikeshare Holdings has invested $30 million into the program, the Partnership Fund for New York City pledged $5 million, the Goldman Sachs Urban Investment Group is lending $15 million for a credit increase, and Citigroup has increased its sponsorship commitment by $70.5 million and has extended it through 2024. (Citi initially paid $41 million for a five-year sponsorship contract). “We believe in Citi Bike’s potential as a fixture of New York City’s public transit system," Mayor de Blasio said in a statement. "It can make our neighborhoods more accessible, help us achieve our sustainability goals, and bridge inequities in our transportation network. To achieve all that, bike share has to be reliable and responsive to community’s needs. Today, after tremendous efforts across our administration, we can say we have the management and the support in place to fulfill that mission." 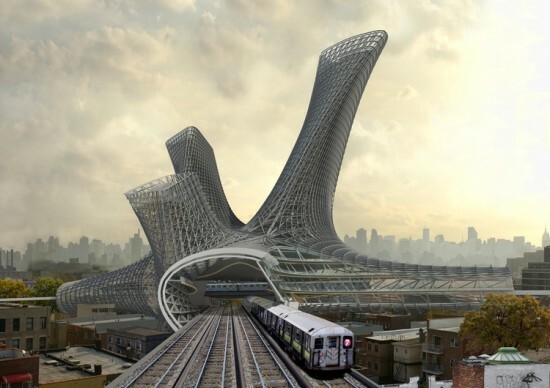 Why cap a transit hub with traditional, mixed-use towers when it can be topped by an amorphous, alien-like, tubular, metallic structurethat seemingly defies gravity? 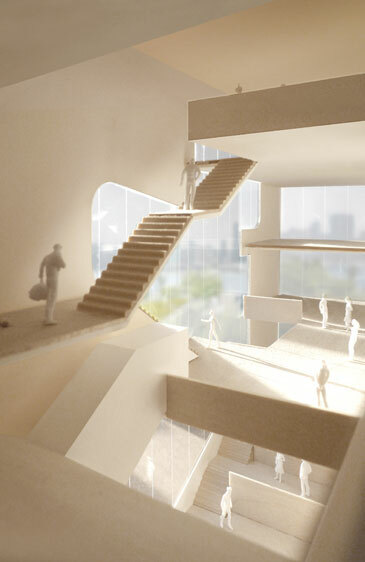 That, apparently, was the thinking behind AMLGM’s “Urban Alloy” proposal for Queens, New York. Their dramatic proposal, which bends and twists above an existing transportation center, includes retail, office, cultural, and residential space within its metallic skin. 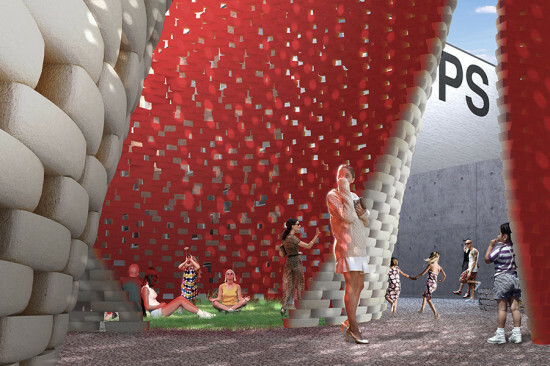 The hypothetical project is the brainchild of New York City–based architects Matt Bowles and Chad Kellogg, and it recently won Metropolis’ Living Cities competition. Using the intersection of the Long Island Railroad and the 7 Line Subway as a test case, the architects place tunnels above existing tracks, and had them converge and transform into towers. The resulting superstructure resembles a piece of coral, or an alien, or maybe even a giant virus. 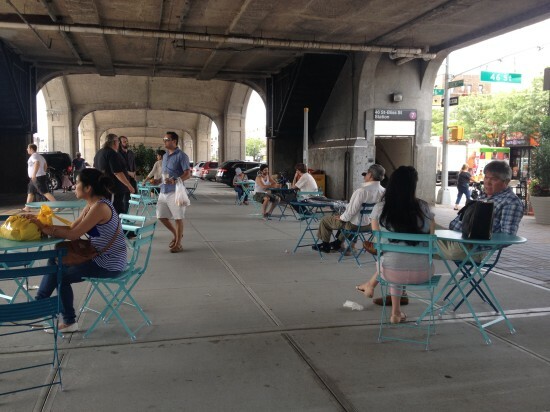 The team says Urban Alloy is an "opportunity to draw the energy of Manhattan out into the four other boroughs without disrupting existing land use." 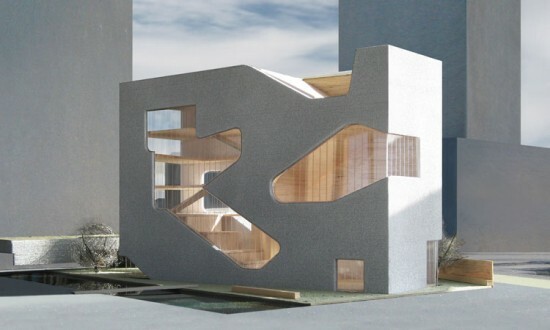 While the radical forms of the proposal might not scream Manhattan at first glance, it's not likely to crawl or slither into reality any time soon. 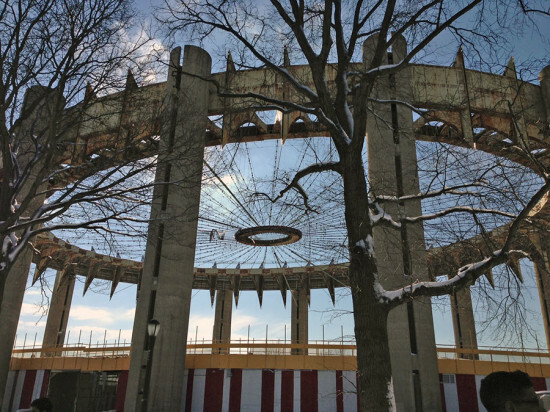 John Catsimatidis, the billionaire-grocery-store-tycoon-turned-failed-mayoral-candidate said he will write a check to save Philip Johnson’s iconic New York State Pavilion in Queens, New York. That is, if someone presents him with the right “visionary” plan. 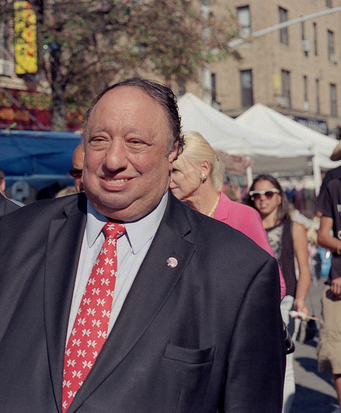 At a recent event to commemorate the 50th anniversary of the World’s Fair, Catsimatidis told the New York Daily News he wants to see another World’s Fair in Queens in the near future. “I can make it happen,” he told The News. “But you need people who have dreams.” It, of course, will take more than dreams alone, and, as the publication notes, Catsimatidis does not have “a specific plan, timeline, or strategy” behind his offer. Oh, the little things. 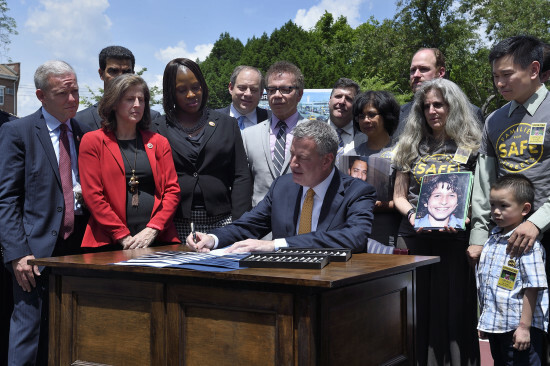 But, if Cats—as he was known during his unsuccessful, but entertaining, mayoral campaign—is true to his word, then he can expect to write a pretty hefty check. 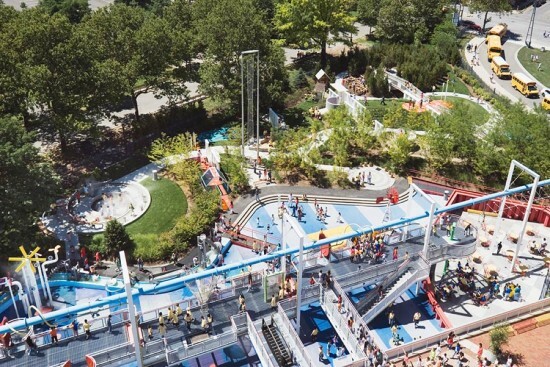 A study by the New York City Parks Department found that preserving the structure as-is will cost about $50 million, and renovating it for new use would set someone like Catsimatidis back $70 million.